Many parents have devised ways to make a birthday party more eco, as Jennifer Lance wrote about here, including sending e-vites, cutting down on paper decorations and plates and distributing favors and party bags that don’t feature plastic junk. One sticky point though is the issue of gifts. Most of us find that our children already have too many toys but, especially at certain ages, kids just aren’t ready to forgo the pile of gifts they are likely to receive. There’s something special about ripping through all of that wrapping paper to display yet another toy. Though charitable giving alternatives exist like Echoage and Heifer, often it isn’t possible to talk a stubborn child into asking that guests not bring a gift. Often it’s even harder to ask guests to forgo that task. Since our friends range from very crunchy to pretty mainstream, we often end up with a pile of presents that, well, let’s just say we find…less than desirable. Last year, to at least avoid a pile of toys we tried registering at Thisnext.com for presents we really would appreciate. This turned out to have mixed results. We buy very few toys in traditional retail stores so in most cases we were asking guests to plan ahead and go online to buy what we might really want. As a result, we ended up with a number of toys that we ended up returning. This actually turned out to be not such a bad thing. After trips to two or three stores to make returns, I ended up with some gifts that my child might actually enjoy. This year I took it a step further. We registered at Target, a place most parents find it easy to visit on a regular basis and one with a generous return policy. We expanded our list beyond toys to pool, sand and sports items and used the cool in-store scanner to create the list…an adventure in itself. After the party as we opened the gifts we found that, for the most part, we received gifts from the registry. Several were duplicates and we placed those in a pile to return for a Target gift card…which I intend to use to buy household products. Yup…now you see why I chose Target. The dollar value of the returned gifts I shared with my son with a game plan for its use. We plan to divide the dollar amount into thirds. One third will go into his savings account. 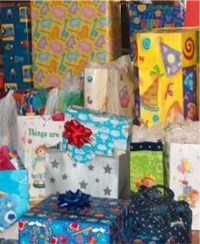 One third will go to a charity associated with our birthday party theme. (This year we chose a jungle theme so the money will go to The World Wildlife Fund.) The balance he may use to buy toys he has requested and of which I approve…in his case Playmobil figures not available in most stores. Though we’ve yet to figure out how to get guests to forgo the wrapping paper, I feel we’ve at least made some progress. i couldn’t handle something huge. one screaming child is enough. i don’t need like…6. xD i just take my son to chuck e cheese just to be simple. This year, we asked the birthday party guests to bring a used book instead of a present. Then, we had a book exchange. I made sure to have extra books on hand for the folks that forgot or decided to bring a gift anyway. The kids all got to open a gift, Abby only ended up with a few things to take home and I didn’t have to get favors. I just sent the kids home with organic, not too sugary granola bars. I think that helped avoid the melt-downs that usually happen at a pre-schooler’s party. We had a lot of fun! You have some great ideas here. Thanks! Finding the right gifts is really tough. You should try http://www.kaddoz.com. It’s a web site that allows you to create a share lists of gift ideas for you or anyone in your family. We also publish a daily blog and we recently had a special week for eco-friendly gift ideas (see http://blog.kaddoz.com/category/style/eco-friendly/). We would appreciate any comments or suggestions to improve. Cheers. Ben. instead of gifts (especially the little ones) I’ve had friends ask for guests to bring books to donate to the child’s school, adopting a needy family, ask for donations to take to the local pound, etc. etc. There are many ways to help the local community that don’t even really require you to buy a goat for an African village, but that is also a possibility. This really teaches children and creates a more long-lasting impact than what a few measley toys can provide. we’ve started this tradition early so our son can get used to it. I am looking for ideas on what to do… will ask guests not to bring gifts – some will listen, but have some mainstream friends that I know will want to buy gifts. I was interested in echoage, but 15% “administrative” cut is a little too much for me to swallow. I think I like the book request idea. I love the ideas of giving money to a charity and world wildlife fund. I know of one child who asked for birthday gifts to be giving to the local humane society. Both of my children have birthdays in December and get so many presents from family. If we throw a birthday party for them with buddies, we now ask for an unwrapped toy for Toys for Tots. My boys got a thrill taking all those toys over to the Toys for Tots depot and helping kids who didn’t get lots of toys for Christmas. We gave the boys their most wanted toy (from us) right before the party so that they didn’t feel like they were missing out on anything. We just had a friend do this mid year so it is something that can be done at any time of year. Even though we made a rule of parties only every 3-4 years, my son is begging to have another party again this year to get more toys for Toys for Tots.